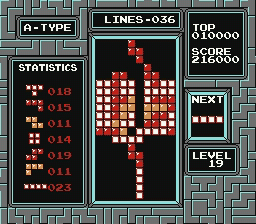 NES Tetris (USA) "fastest 999999" in 03:56.42 by Nico Cannino. It warps directly to the 19th level and fills half of the field quickly to be able to operate short distances in the top part of the field. From there on, it only gets tetrises (4-line clearings) until the score is maxed out. Putting the long pieces in the middle allows for higher stacking before you clear any blocks, giving this version a 10 second edge over the previous. The occasional blinks in the movie are caused by rapid pausing to manipulate luck.